About a hundred million years ago, an iguanodon was browsing in a deep mudflat when it found itself stuck. Perhaps hearing its helpless bleat — or smelling its rotting corpse — a pack of meat-hungry Utahraptors ran in to feed. But in the end, all of them — victim and predators alike — became drawn in to the mudsink and perished together. The result is uncommonly large, concentrated, and well-preserved dinosaur graveyard, with the remains of at least a dozen dinosaurs — and possibly fish, birds, plants and other organisms — ensconced in rock under a cliff near Moab, Utah. Paleontologists have extracted eight jawbones of Utahraptors so far, and they tell local media that they’re struck by the remains’ “exceptional” state of preservation, as well as the sheer amount that likely awaits to be excavated. 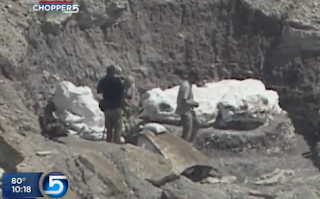 “What’s in it is so dense, we can’t put an ice pick into it without hitting a skeleton,” Utah’s state paleontologist James Kirkland told KSL-TV. The mass was initially discovered in 2001 by a geology student doing field work, and paleontologists have been picking at its outer edges for the past dozen years. The problem scientists face now is that the deposit is too large, heavy and dense to be moved to a lab for further study. A local contracting company has volunteered to build a box big enough to house the 5-ton deposit and then drag it down the talus slope to a truck. But the paleontologists fear the fossils won’t survive the trip. Their preferred option is reportedly a heavy-lift helicopter, although none are available in the state. A fundraising drive may get underway to hire a helicopter that can do the job. “This is pretty much bigger than anything the Air National Guard in Utah has available,” Kirkland said. Upadate: A spokesperson for the Utah Geological Survey said no fundraising effort has been started yet but more information will be available when researchers are back from the field. We’ll keep you posted. let’s go out there and get those dinos! Why don’t they build whatever they need around the site and not transport it anywhere? What a great find. I hope to hear more about this.